One. Ugg Cable Knit Hat- A fur pom hat is a winter essential- and there’s no one better than Ugg to keep her warm! Two. Tory Burch Metallic Tote– More on the splurge side, this metallic tote will go with and hold everything she needs. Four. Make + Model Girlfriend Pajamas– Because what New England gal doesn’t like blue and white check? Pajamas are one of my fave gift ideas because I feel like people rarely splurge on those themselves. Five. Lulu DK Initial Necklace– A twist on a monogrammed necklace that is under $70! Such a great gift idea. Six. Cathy’s Concepts Monogram Herringbone Throw– Perfect for a night filled with Netflix and wine, gift this on its own or paired with the candle above (or a bottle of wine) for your gal who prefers a night in. Seven. 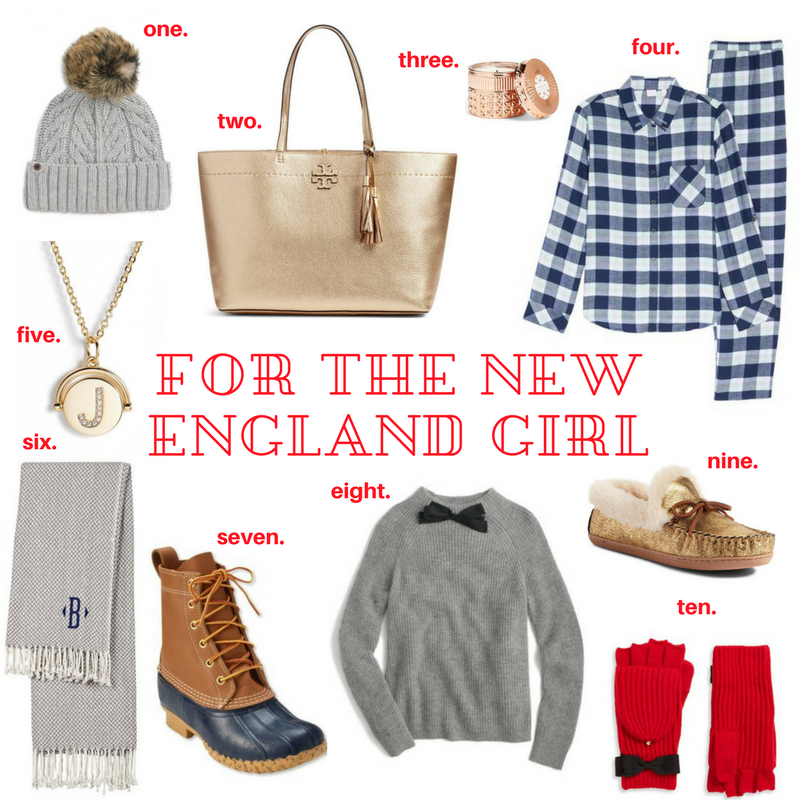 L.L.Bean Bean Boots in Navy– A must have for any New England girl, the navy color makes them sure to go with just about everything in her closet. Eight. J.Crew Tie Neck Sweater– If there’s a bow on it, she’s gotta have it! This sweater comes in three different colors- gray, ivory and blush- so there’s one for every gal on your list. Ten. Kate Spade Bow Mittens– Another bow! These mittens are adorable for winter and come in a variety of colors including stripes!